July is National Watermelon Month! 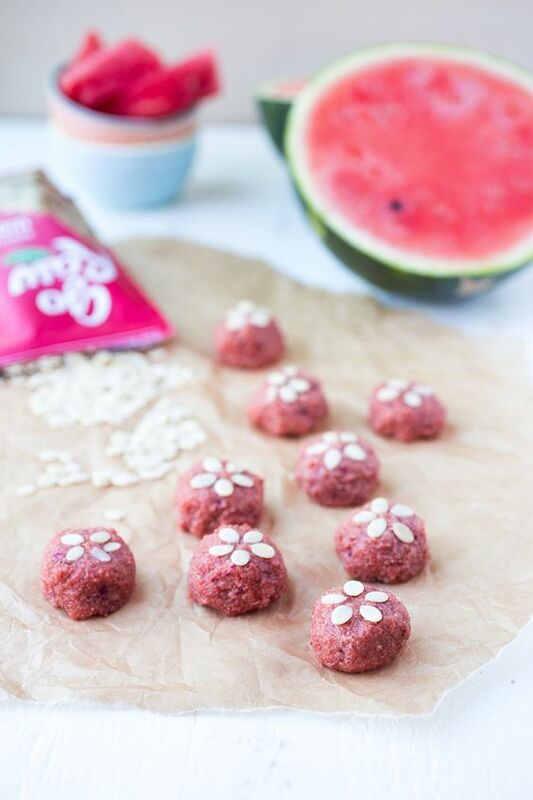 To celebrate, I’ve partnered with Go Raw and the National Watermelon Board (yes, that’s a thing), to create this delicious and convenient summer treat, Frozen Protein Watermelon Bites! Did you know that watermelon seeds are not only totally edible, but they’re also PACKED with protein? Go Raw sells certified organic sprouted watermelon seeds that make an amazing snack on their own. Plus, they also just launched a line of watermelon seed protein bars that are super clean and don’t contain any additional protein source. The watermelon seeds alone provide 12g per bar. Pretty incredible, right? 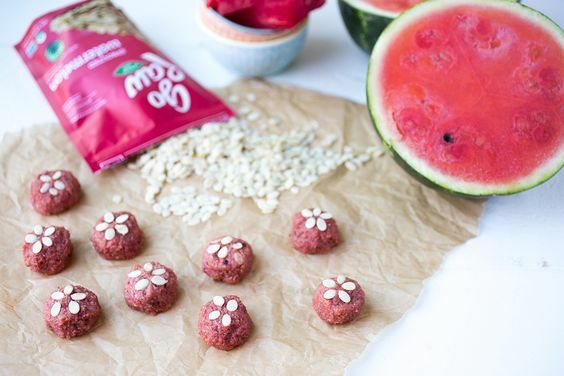 These Frozen Protein Watermelon Bites use Go Raw’s sprouted watermelon seeds. They have about 5g protein per bite and are full of healthy fats and nutrients. They’re perfect for a quick breakfast or post-workout snack, especially after a hot summer workout. Want to help me win the Watermelon Month recipe contest? Vote by liking and/or sharing the post below before July 29th! Pit dates if they’re not pitted already and chop them in half. Place into a bowl of purified water and allow to soak for 1-2 hours. Once dates are soaked, remove them and place them into a food processor. Pulse a few times and then add 1 cup watermelon seeds, coconut butter, watermelon, reserving ½ cup of the seeds for later. Add the mashed beet if you are using it. The beet gives the bites more of a pink color but does not affect the flavor and is therefore totally optional. Blend until well combined, scraping the sides of the food processor as you go. Add the rest of your watermelon seeds and pulse so that some of the seeds remain chunky. If you want a smoother texture, continue to blend but I think these are great with a nice crunch. Remove mixture from food processor, place in a small bowl and cover, allowing to cool in the fridge for 30 minutes. Remove the mixture from the fridge and keeping your fingertips slightly wet, roll the mixture into balls and place only a plate. Once you are done rolling, add a few extra watermelon seeds to the top. If you want to create cake pops, add sticks to the side of the bites before placing in the freezer.